When I was planning for this year’s Morning Basket, I wanted to think in broader categories and fill in from there. So, I decided to think in terms of the Good, True and Beautiful. I’ve mentioned before that some days (not often…but some days) I need the Morning Basket to stand on its own (insert >>doctors/dentist appointments…outside activities here<<). Considering the Morning Basket as a cornerstone of the Good, True and Beautiful in our day means that if I have to walk away from formal plans at this point, I’m sure that imaginations have been nurtured and fed. …which I can then print, one for each new week, and simply note what I included in the appropriate box. 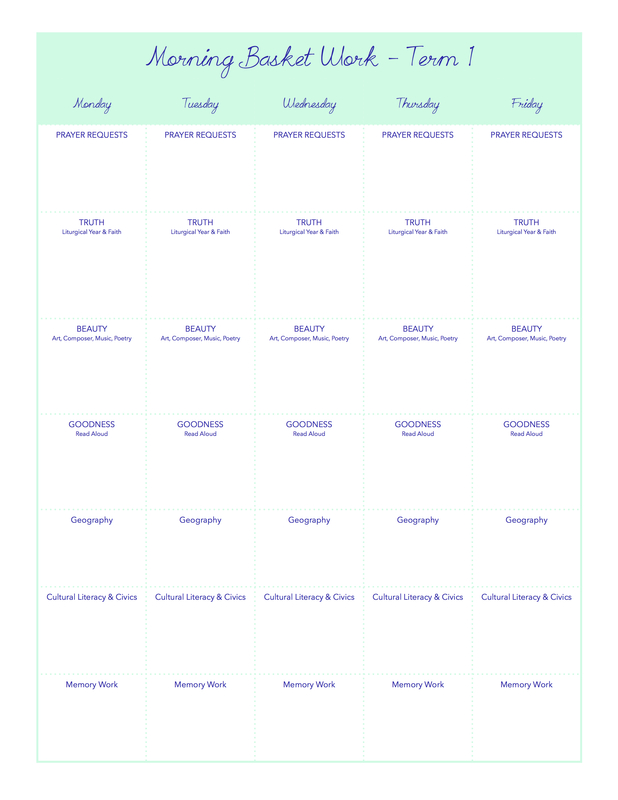 –> If you’d like a printable copy, you can download a free copy here: Morning Basket blank planning grid. If you’d like to recreate something like this yourself, this is just a simple table dropped into a Word Processing document. Nothing fancy! 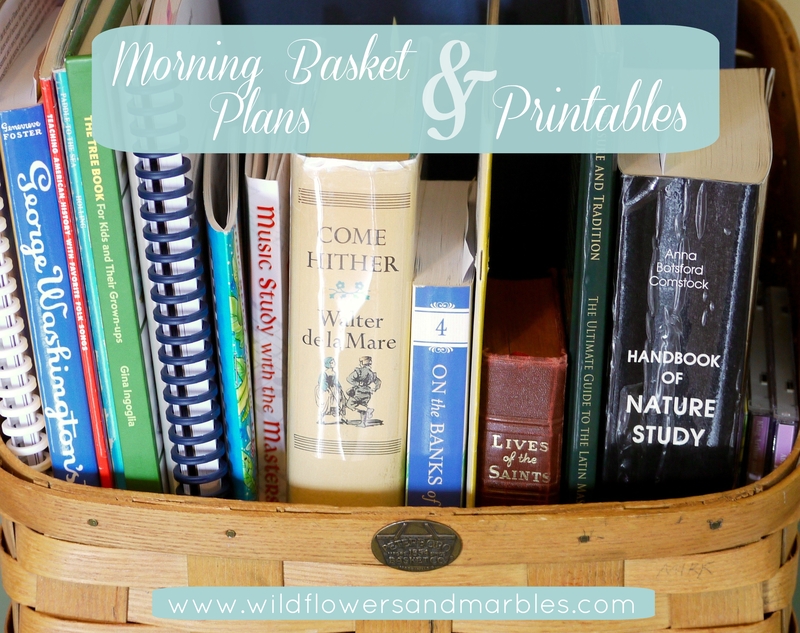 I’ll share a bit about the books and resources we’re using for each section of the Morning Basket. If you look at my chart, you can see that I’ve spread out the rich feast of offerings throughout the week – for example, if you look at the top banner of my chart you’ll see that we cover art and picture study along with a faith read aloud on Mondays; Tuesdays are for Folk Songs, Plutarch and a short Geography lesson; and so on. This ensures that I cover a wide spectrum of the Good, True and Beautiful throughout the week, and my chart keeps me focused, ensuring that each day is varied and simple! We begin each morning by reviewing prayer requests and intentions, reviewing new prayers we’re memorizing (you can learn so many new prayers by spending 5 minutes a day on them in the Morning Basket!) and reading about the saint of the day. We use Rev. Hugo Hoever’s, Lives of the Saints for this (note that we follow the 1962 calendar in attending the Extraordinary Form of the Mass). The children say their morning prayers individually each morning before they come downstairs…before the day ever starts. Katie (my 7 year old) is training Lauren (my 2 year old) to say her prayers by modeling while Lauren listens and mimics. Sweet! Nothing is more helpful than a good example repeated regularly! 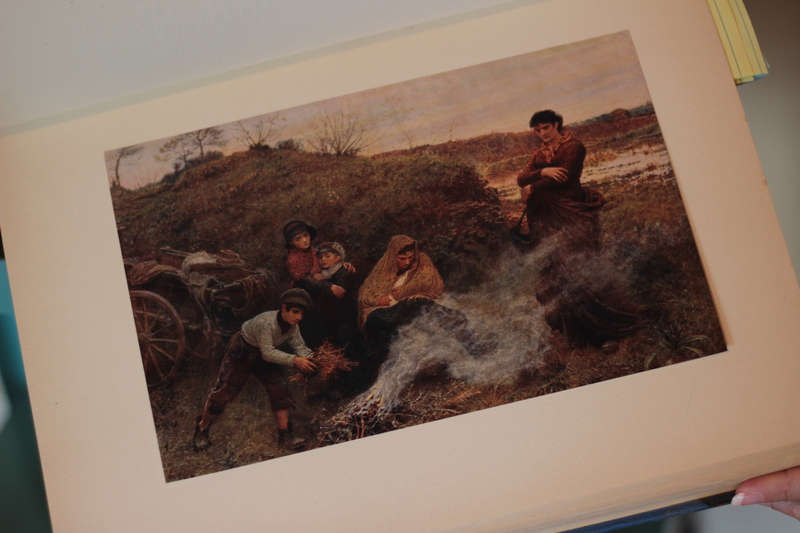 Art & Picture Study – I’m using a very old, found-treasure of a book, Famous Paintings Selected From the World’s Great Galleries and Reproduced in Color, in two volumes, with notes and commentary by G.K. Chesterton. I’m pretty sure I’ve talked about this resource before because I’ve used it in past Morning Baskets, but as kids get older, and new kids come along, these past resources are fresh and ready to be enjoyed again! The index makes it helpful to plan paintings for the term. I use these books in the same way I use any other art print, the children study it for a few minutes (in silence) and then they narrate the painting back to me. I’m always amazed at some little detail they remember that I didn’t notice. If you ever have a chance to secure these two wonderful books, don’t hesitate! Treasure and Tradition: The Ultimate Guide to the Latin Mass – I always choose something special to read aloud as part of the Morning Basket that will enrich our faith. Last year we slowly read through the 40 Dreams of St. John Bosco and WOW! If you’ve got boys, you’ve got to include this in your rotation at some point! It’s just wonderful and gives so many practical helps to build virtue and avoid vice! This year, we’re reading through St. Augustine Academy Press’, Treasure and Tradition, and it’s an absolute joy! We’re learning so much about the rich, rich history of the liturgy, it’s structure, the meaning behind the structure (so deep!). It’s full of so much beauty, and it’s a wonderful fit for the Morning Basket because it’s easily managed in very small, bite-size chunks! : The beginning of the book contains rich background and explanations on our faith. We read one page at a time in this section. : The majority of the book is set up to be used as a Missal, with the right facing page containing the Missal for a portion of the Mass and the left facing page containing rich historical details and information pertaining to THAT section of the Missal. : We read and discuss one two-page spread each week. : The pages are glossy and lovely to touch and view. The photos and illustrations are brilliant and absolutely stunning! There are many, many illustrations from older books and art that help cement understanding and visualize historical explanations. For example, I have seen many illustrations of the Holy of Holies, but the full color version included in this book is excellent! As are the many diagrams that assist in understanding the structure of the Mass – like the beautiful depiction of the Canon of the Mass. : My 7 year old does sometimes bring this book to Mass and uses it as a Missal. The inside cover contains “key” images that show Father’s position at the altar, what he’s doing, and indexes it to that page in the Missal. When she gets lost at Mass, she looks at Father, notes where he is and what his gestures are, finds the corresponding illustration in her book, and flips to the right section in the Missal. I’ve not seen anything this useful for little ones learning the Mass – EVER! Don’t laugh – we’re working on some civics understanding this year, so I’m throwing good ol’ Schoolhouse Rock into our “Folksong” slot. Because…….We, the people, in order to form a more perfect union…….sing along! I know you know it! I have a new book I’m still previewing: Teaching American History Through Favorite Folk Songs. It seems like it has potential, but I need to review it more closely! For Plutarch, we’re following the Ambleside Online rotation, and reading Marcus Cato this term. Yep, even to the 7 year old. Do be sure to check out Anne White’s study guides (they’re linked next to each term’s Plutarch schedule and they make a tremendous difference in reading and understanding Plutarch!) Read the study guide first (to yourself), then read the Plutarch selection aloud ONLY to yourself. This will help tremendously with your ability to read aloud to the kids, emphasizing the correct parts, and giving a good, understandable read. Then discuss vocabulary, review where you were in last week’s reading, and then begin. I read 1-2 paragraphs at a time and then ask for a narration. This is an area that really benefits from a group narration and that’s why Plutarch always lives in my Morning Basket. My bigger, more experienced narrators really help in digging into some details and nuances of Plutarch that might be lost on littler kids initially, but the shared narration helps everyone along. Geography was something I wanted to work on with more attentive focus this year. If you haven’t read my recent post on Map-Dots, be sure to check it out because it has done so much for connecting places for our family! In addition, I’m using Charlotte Mason’s Geography book (online free here). I’m not following a schedule, we’re just reading and discussing one lesson a week. I’ve selected poems from Walter de la Mare’s Collection: Come Hither: A Collection of Rhymes and Poems for the Young of All Ages . It’s been an absolute delight! I selected the poems I’d read at the beginning of the term, one per week. I chose this book because I heard Mortimer Adler recommend it somewhere (he was discussing poetry compendiums and specifically mentioned this one) and it hasn’t been a disappointment! The poems are so evocative and each of the chosen poems is a delight to the imagination. And friends…ahem…can I just say, “15 year old boys”…and do you get me? They don’t typically gravitate toward poetry, but my son enjoys these and narrates them so well! All my kids do! I read a poem aloud, the kids narrate it as a group narration (they take turns, speak one at a time, a strict rule of no-interrupting is enforced). I’m keeping this collection as part of the Morning Basket for some time! For composer and classical music we’re finishing up Bach, just because we so enjoy listening to him, and after that we’ll follow along with Ambleside Online’s schedule, enjoying Johannes Brahms. I still hadn’t finished planning out all of our hymns for this term at the time I posted this – so I’ll add to my list as we progress. Mostly, I’m working on reviewing some hymns that my seven year old tends to slur and sing one known word loudly, while singing another 2-4 words equally as loud, yet completely indistinguishable. A sort of blend of words…so it ends up resonating through church as something like this: “amenny-ammoon-SACRAMENTUM-aa-aa-yay-yay-yay-CERNUI”. Thus. Review. For our focused nature study elements we’re studying trees this term, reading one section in the chapter on “trees” in Comstock’s Handbook of Nature Study . I wanted to make better use of this excellent resource, and this term’s reading has been a success! After reading a small section, I challenge the children to find something out of doors that might illustrate our daily reading. This isn’t a requirement, and isn’t always feasible, but it is a help in focusing these weekly nature walks. I’m also reading a little each week from Gina Ingoglia’s, The Tree Book . The introductory sections are wonderful, and so are the individual sections on particular trees. The illustrations are simple, yet lovely, and provide rich inspirations for our nature notebooks. Pick one habit to work on each term. Not a collection. Not a group. Not one new habit each week. ONE habit for EVERY 10-12 weeks. Slow and steady, my friends. This term’s habit is: Kindness. ….ahem…this habit may require more than one term’s worth of focus to see any fruit. I prepare by reading about the selected habit in Laying Down the Rails: A Charlotte Mason Habits Handbook. This book is simply a compendium of Miss Mason’s thoughts and words on particular habits. She had lots to say! 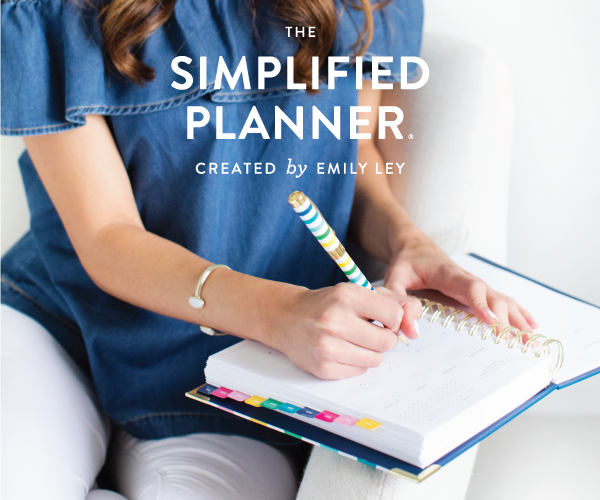 You don’t *need* this book, but it’s certainly a time saver and helper for me in staying organized because it’s all collected and grouped nicely. As I read, I make notes about supernatural virtues and Catholic ideas I might want to cover. I glance through my own books to see if I can fill in those Catholic viewpoints with a few readings from books I own. I open up the corresponding habit (Kindness for this term) in the Laying Down the Rails for Children: A Home Companion book. (This is a great explanation detailing the differences between these two books). I spend a little time reviewing the habit section. Each section is broken into lessons, and I make notes in each lesson – I may want to add something. I especially like to add stories of a saint that embodies that virtue/habit. The provided stories and poems are quite rich and lovely! I cover one lesson/week and throughout the week, I refer to a lesson or poem or example and encourage growth in a virtue. I might also work privately with an indivicual child, encouraging simple helps and mortifications (making small, daily sacrifices) which might help them grow toward virtue and target a vice. Each lesson really is quite simple – reading something short aloud and discussing it. It’s the lingering and continuing conversations which fit into everyday life that really help cement! Did I mention slow and steady? Really! No rushing! While this resource is not Catholic, it is certainly Christian in content and I have found nothing anti-Catholic, or that would be objectionable for a Catholic to use. Therefore, I can recommend it to you without reservation, encouraging you to add in the richness from our Catholic understanding of supernatural virtues, the great helps we have in the graces we receive in the Sacraments, and the beautiful examples of our big brothers and sisters, the saints. My final resource has been a really fun hit this year! We’re using E.D. Hirsch’s Appendix list – What Literate Americans Know – found in the back of Cultural Literacy: What Every American Needs to Know as part of our dinner table conversation. 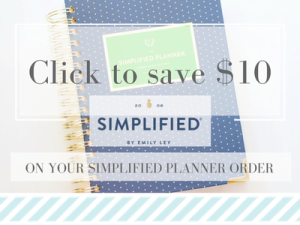 This really couldn’t be simpler – no elaborate planning, charting, list-making required! I keep the appendix bookmarked, I open it after we say prayers, I read the next word on the list (example: Achilles’ heel) and look up at the family…waiting…looking….does anyone know what this is? Have they heard it before? Can they guess? Anyone? The discussions and conversations have been fun and enriching. A couple have stumped me! And my little kids have surprised me in some of the things they know – especially references stemming from a mythological story! I started this as a way of extending the idea of the Morning Basket a bit and targeting some culturally relevant terms I hoped my big kids would know. Especially my biggest kid who has graduated and is out in the work force. We only read and discuss a few terms (enjoying the ensuing conversation), and we only do this when everyone in the family is at dinner together. You may have to research a few of these, but the results and growing cultural literacy has been fantastic! Lots of potential here! Crusade Magazine – This is an out-of-print series that is so worthwhile to search and find! All total there are 45 issues, but issues 1 – 20 and 21-40 are the easiest to find. I have issues 1-40 thanks to a dear friend who gifted them to me years ago, and I’ve used some variation of them every single year since then. This year, I’m using selected issues as Church History (as a replacement for Trial and Triumph used in Ambleside Online, Years 1-5), and I really love how it is working out! Issues #21, 23, 25,27, 29, 31, 33, 35, 37, 39 all contain stories that pertain to Church History. 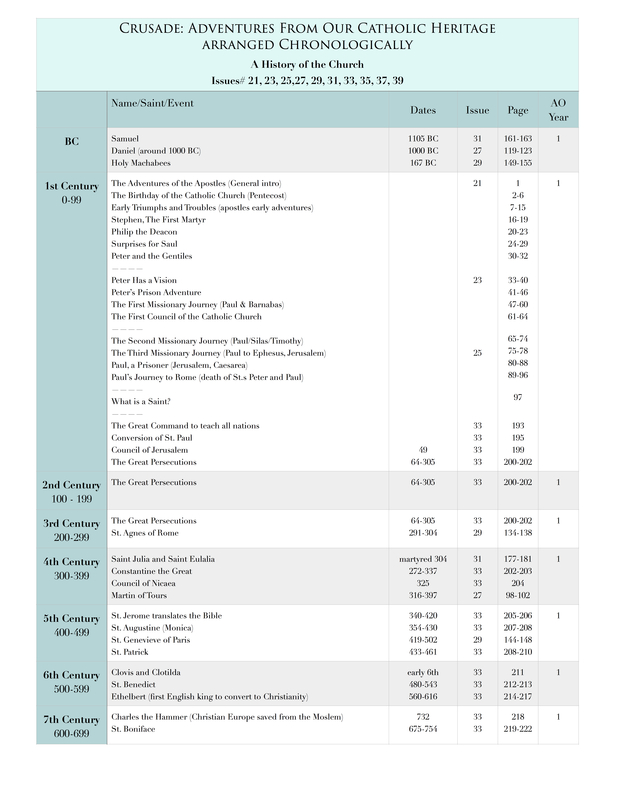 If you have the Crusade series, and would like to use these issues to read through Church History, I made a chart which indexes these issues within the series chronologically and also coordinates the history period read with the Church History covered in Ambleside Online years. Little House on the Prairie series – We started reading this series last year, and we’re continuing. This series is so rich in virtue examples!! And it’s just a fantastic read aloud. My oldest read this series for herself, and when I realized no one else had read it yet, it was a no-brainer to add to the schedule. George Washington’s World – This book makes a great read aloud because the chapters are so short and lend themselves well to reading aloud in one sitting. The writing is excellent and reaches many ages all at once. I didn’t intend for this to get quite so long, but I do hope you enjoyed a little peek at our Morning Basket. I think I mentioned at the top of this post that I really hoped to simplify our Morning Basket time this year, and after 5 weeks of Morning Basket, it’s been a great success! Each Morning Basket takes around 30-45 minutes! If you’re looking for a way to organize it all…all the poems…the lists…the memory work…your resources – you’ll want to see this! And…for more Morning Basket inspiration, click on over to my friend, Pam’s Morning Basket podcast series, and subscribe! She has some amazing guests talking about all-things-Morning-Basket! 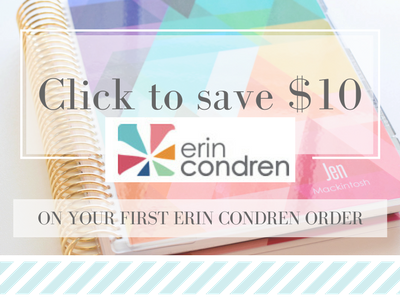 Her first podcast with Cindy Rollins is already available – so wonderful! Pam and I chatted about the Morning Basket as part of her series, and I can’t wait for her to share it with you! Wow! This is amazing and I love how organized you are! I pinned this so I can come back tomorrow and read again!! Thanks for the inspiration! Thank you so much, Leah! I’m so grateful! Jennifer, this post is just FABULOUS!!! I skimmed it and realized that there is just WAY too much goodness here for me to give it the attention it deserves right now before I head to bed, so I am keeping this open in a tab for a time when I have full attention to go through your format and your suggestions. I love what I see so far, so I just wanted to quickly say thank you for sharing it all! Thank you, Jennifer. You reminded me of some great resources I could and should be using. God bless. Thank you! I just love being reminded of treasures I have on my shelves! Happy shelf-shopping! Jennifer, this is a wonderful post!! Thank you SO much for sharing it. Love the Treasure and Tradition book. I have the tree book and will actually crack it open now 😉 Would you mind sharing the saints listed in the Lives of the Saints book you mentioned? We have many saints books, but, are always looking for other good ones. Fantastic! Hi Ann-Marie! Thanks so much for your encouraging words! Rev. Hugo Hoever’s Lives of the Saints covers 365 saints (one for each day of the year) from the Liturgical Calendar as it was set in 1955, the time of publication. It would be too many to list for you, I’m afraid, but the selections are lovely, and we’ve certainly learned about some saints that we didn’t know about before! What a great post! I really love how you laid out your morning basket chart with categories (Truth, Beauty, etc.)! And thanks for sharing all the details of what you are including in your morning basket for each day. A great post! The Tree Book is a favorite hear 🙂 I will refer to this post often. Thank you!!! 🙂 This is such a very small question… but I know I’ve read it on here before somewhere and can’t find it… What program do you use to design all your lovely charts/schedules/etc…? I have a macbook air and I use the macintosh version of Microsoft Word to create all my documents. It’s called Pages, and it is just a word processor – so you can do the same thing I’m doing using any Word Processor. I start with a blank document, insert a table, and start working. Changing the color of the grid of the table and using a pretty font is my secret trick and it’s what I like to do to add a little touch of pretty. If you have an afternoon sometime, just insert a table into a document and play around with pretty fonts and experiment with colors…once you have a template of your favorite fonts and colors, creating documents is easy! Thank you so much, Anne! You’re so encouraging! Love this!!! Awesome post, I also have been reading St. John Bosco’s dreams to my kids, it has been a real eye opener for them. Thank you so much, Katherine! St. John Bosco really packs a punch! My eldest gave me Treasure and Tradition for Christmas and it is indeed a most beautiful book, and we’re presently reading Come Hither here too. One question – what ages would you say the stories in Rails for Children are geared toward? thanks! Thank you so much, Kimberlee! 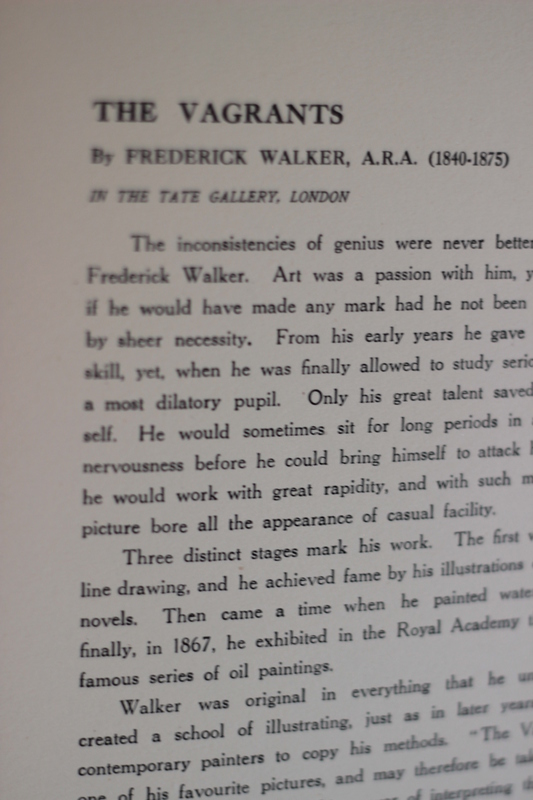 You will not be disappointed with Chesterton’s collection of Famous Paintings! 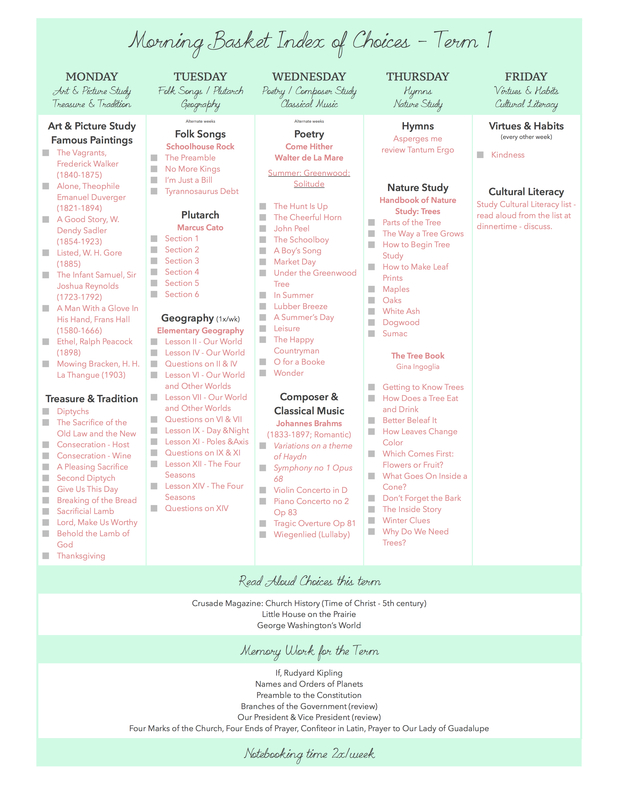 I think that lists probably gives you a sense of the overall “flavor.” I’ve been using this resource for a few years and I’ve read the stories aloud successfully to all my kids here – from high school senior on down to preschooler. Fantastic post loaded with goodness! Thank you so much, Jennifer, for sharing all of this with us. What version/edition of Plutarch are you using? We have Lives from Plutarch by John McFarland, Pleasant and Audrey Graves, but I see on AO that Anne White’s study guides are using North’s translation. Thank you, again, and God bless you! I use both North and Dryden’s translation of Plutarch. I have Dryden’s translation in my set of Great Books, but Anne White usually (not always) uses North because that’s what CM used. I print Anne White’s study notes directly from AO along with the translation provided (which is North) and then I pro-click it all together (our 3 “lives” – one for each term) and put it in my Morning Basket. And then I can make notes and write all over that – which I do, noting geography, additional vocabulary I might need to treat, and making other notes for myself. When I’m pre-reading, I sometimes compare Dryden to North and may swap up, but usually I just use whatever Anne White used in her notes. North and Dryden are considered the “real deal” and all the others are children’s adaptations – which are good, but obviously…still an adaptation. ** So…North’s translation is in the public domain and you can get it free for your ebook or print it (but it’s voluminous so I’d recommend only printing a few lives at a time). ** And…Dryden’s translation may be in the public domain, too, but I have it as volume 14 of the Great Books of the Western World. Both are challenging translations to read! And since I always read Plutarch aloud as part of my Morning Basket, I typically try to “prime my littler kids” with a children’s adaptation before we dig into Dryden or North. I do this in different ways – sometimes I read the entire adaptation, or sometimes just snippets I’ve selected, or sometimes not at all – for example, this term we’re reading Marcus Cato and I’m reading North’s translation without using any introduction or set up from a children’s adaptation. It’s going well so I may continue this. The key to Plutarch is preparation-preparation-preparation! Read each selection aloud BEFORE you read it to the kids, review the vocabulary with the kids before the reading, review where you were in your last reading as a way of setting up. And, for us, reading as a group and narrating as a group makes a tremendous difference! I know this is more than you were asking, but I hope this is a help, Kelly! You mentioned that each morning you review prayers you are memorizing. Is there a particular resource you use for prayers to learn? The Saint Andrew Daily Missal – we spent the entire year last year memorizing the Morning Prayers as listed in the St. Andrew Missal – so worthwhile! I love this missal for the prayers (morning, evening, litanies, etc) listed as well as the VERY rich liturgical history that is given before each day in the liturgical year/season. Note that this is a 1945 missal that pre-dates even the Extraordinary Form, which uses the 1962 missal. It does follow the same rubrics as the 1962 Missal though, so it will be most familiar to those attending the Extraordinary Form (TLM/Latin Mass), but this missal is so rich that it is of value in anyone’s prayer basket! The morning prayers are just extraordinary! If my house were on fire and I could grab one devotional/faith book, it would be the Saint Andrew Daily Missal because we can read the daily Mass readings, enjoy the liturgical treasures shared, and use the prayers listed. You can purchase it directly through St. Bonaventure Press, and in doing a quick search I found used copies much less expensive here at Amazon . I love the Saint Andrew Daily Missal, but when we attend Mass (in the Extraordinary Form) I find the Angelus Press Missal (1962) to be the most intuitive for following Mass, and although you didn’t ask about a Missal (and I’m sorry I just mentioned two!! ), it’s this Missal that also has a number of other prayers contained in it, such as the Prayer to Our Lady of Guadalupe, that we’ve been learning lately. This prayer is so beautiful and a powerful way to pray for our country! This is the missal I got the Prayer to St. Joseph from. One other favorite prayer book of mine is, Mother Love , written by a priest of the Capuchin Order. This little treasure was originally written in 1888, but has been updated (only to reflect current indulgences as per the Enchiridion). I love the prayers for special necessities of a Christian Mother!! And I love the special instructions that have been so helpful to me – like the 10 commandments of a Christian Education! This book is (obviously) written most tenderly to us as mothers, and it contains suggestions for which prayers to teach our young children, as well as prayers we would enjoy in certain situations, and many basic prayers and some beautiful (not so basic) that I’ve enjoyed learning. This is one of my absolute favorites! I hope this helps and gives you an idea for where to start, Karen! This is my family’s 16th year homeschooling 5 children (2 are no in college). We started out using the Classical method, adding more and more of the Charlotte Mason philosophy as the years have gone by. But after all these years our little school has become a bit stagnant. While juggling the needs (school and job-related) of my high school senior and a 7th grader and 4th grader I’ve been feeling the need to change things up a bit. I just wasn’t sure how or what I needed to do. Morning Basket time is PERFECT! Thank you so much for sharing this delightful idea and all your resources. I can’t wait to set up,our basket this weekend! Hello! I’m an avid reader of your blog, and I was re-reading some of your morning basket posts. I’m curious, did you end up getting to your post discussing your Morning Basket Binder? I would LOVE to read about it! Thank you for all the encouragement and inspiration you give to us homeschooling moms!